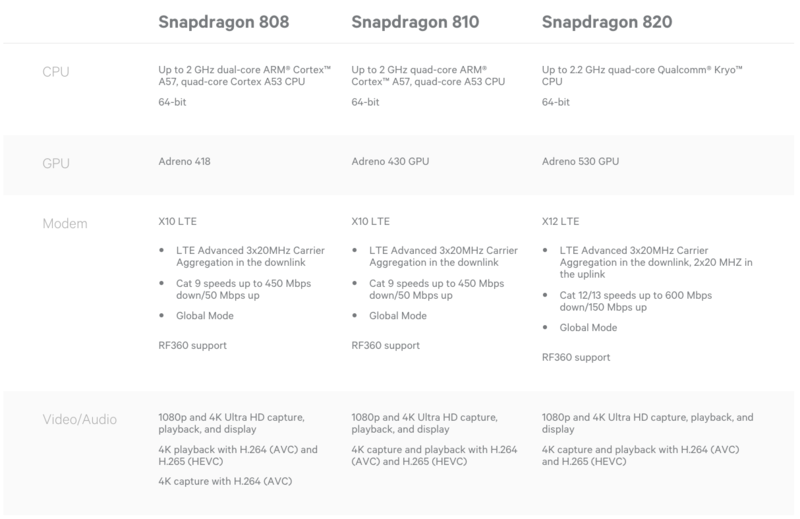 This morning, Qualcomm revealed the full details of its new flagship processor, the Snapdragon 820. With this latest mobile chipset, Qualcomm set out to create a technology that was “holistically designed around enriching visual quality and audio clarity.” That’s marketing speak for a powerful graphics processing unit (GPU), better image processing, and better audio out of a phone’s speakers. It also ups the game in terms of quick charging, has faster download/upload speeds than previous chipsets, and 2x the performance of the the Snapdragon 810. X12 LTE Modem: Offers 3x faster “peak” upload speeds and 33% faster “peak” download speeds when compared to the X10 LTE modem found in the Snapdragon 810 and 808. With LTE Cat 12 support, download speeds can reach 600Mbps, while Cat 13 upload speeds can rise to 150Mbps. Adreno 530 GPU: Offers a 40% improvement across the board over the Adreno 430, so we’re talking better graphics performance, computer capabilities, and power usage. Quick Charge 3.0: This new quick charging is 38% more efficient than Quick Charge 2.0 and 4x faster than “conventional” charging. Advanced WiFi: Supports both 802.11ad and 802.11ac 2×2-MU-MIMO WiFi, which is 2x or 3x faster than 802.11ac WiFi without MU-MIMO. Here is a quick comparison of the 820 to the 810 and 808. Qualcomm still says to not expect any phones running the Snapdragon 820 until next year.